John F. Sullivan was born to Elizabeth and Patrick J. Sullivan in Estherville, Iowa on November 29, 1884. Both parents immigrated from County Cork, Ireland. John had two brothers William and Joseph; and three sisters. John came to Mandan in 1907. He had graduated from the University of Minnesota with honors from the School of Law. John was only twenty, so was too young to be admitted to the North Dakota Bar. He spent his first year working for the abstractor in Mandan. John�s first step into law practice was a partnership formed with James Hanley in 1909. Mr. Hanley�s former partner, Mr. Voss, had passed away. Hanley and Sullivan formed a life-long partnership. Nance Wilkinson came to Mandan and taught school for a year and a half. Nan is the daughter of Angus and Rhonda Rose Wilkinson, she was born in Nora Springs, Inowa. Angus Wilkinson was from Argyllshire County. Scotland. Rhoda�s family in the United States dates back to the 1600s when her ancestor Converse came to New York from England. Nora Springs, Iowa is no longer on the maps, it is covered now by the waters of the Mississippi River, not far from LaCrosse, Wisconsin. Nan attended the University of Michigan before she came to Mandan to teach. <?xml:namespace prefix = o ns = "urn:schemas-microsoft-com:office:office" />Nan and John were married in 1909 at Kansas City, Missouri at the home of her uncle. John was a livelong Democrat until F. D. Roosevelt became President. Nan, a Republican had tried for many years to change his ideas, and Rosevelt did it in three months. John was on the Board of Directors of the Mandan Creamery and Produce Company and also Montana-Dakota Utilities. He and the children were members of St. Joseph Catholic Church. One dinner party, Nan remembers was after the dedication of the new Bridge across the Missouri River, Mrs. Lyon and her children came from Minneapolis for the dedication. Nan and John had a dinner party for them and invited many of their friends from Mandan. A roast duck dinner with all the trimmings was served to twenty guests. 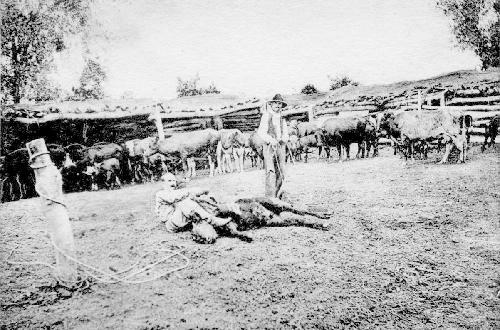 John acquired the Cannonball Ranch from the family of Henry Sidney Parkin who had homesteaded the site starting in approximately 1873. 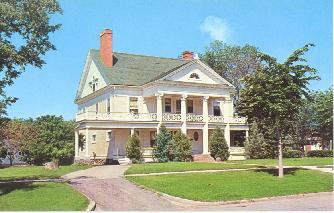 The ranch, located approximately 30 miles south of Mandan, and was large enough to support upwards of seven hundred head of cattle. John�s outdoor recreation was the weekends he spent at the ranch. When the Oahe Dam was built, many acres of the Cannonball Ranch were lost. John offered the government the opportunity to lease the land for $1.00 and that he retain ownership of it. The government insisted on buying the land and when offer John a specific sum. John felt it was not enough, so they went to court and the final settlement received more than twice what they offered. The H. S. Parkins, Van Solens and an infant child were buried in the Cannonball Ranch on top of a butte. John had reassured Lucile Van Solen, from whom he bought the ranch, that the graves would remain there. The graves were moved by order of US Marshall over the objections of the Sullivan family, but the iron fence that was around the family cemetery is still on the ranch. John and Nan Sullivan were the parents of four children: John F. II, who was born in 1911 and died in 1972. John F. II was a graduate of Northwestern University. He and his wife had three children: John F. III who lived in Bismarck, ND, Patrick who lived in Minot, and Judith (Mrs. Gerald) Dawson who followed her husband to Tampa, Florida. Patrick Angus Sullivan was born in 1918 and died at the age of one and a half. Their twin daughters were born in 1923. They are Mrs. John (Nancy) Kennedy, Tucson Arizona and Mrs. George (Kathleen) Conner, Minneapolis, Minnesota. John Sullivan died on June 8, 1950. He is buried beside his wife in Union Cemetery, Mandan.